Have bought two of these. Extremely sturdy and great price! Highlighted by a unique floral and avian pattern, this 7-piece comforter set lends friendly rustic charm to any bedroom. The soft cotton and polyester construction ensures warm, cozy nights, and the entire set is machine washable for convenient cleaning. Lovely and a great value! I purchased this lovely bedding set for the small bedroom of our winter haven in Florida. The overall color of the bird-patterned fabric is beige--but it is light--only a shade or two darker than ivory. There are numerous blues such as duck egg blue, robin egg blue and muted turquoise found on the bird who also has a dark red beak. This bird patterned fabric is soft to the touch and lightly textured. The light blue fabric on the bedskirt and the pillows is the type of light blue color that has a bit of gray in it making the color a bit subdued rather than bright. The overall effect is serene and restful to me. One pillow has an embroidered bird on it. The detail and craftsmanship is outstanding for the price! I would not hesitate to recommend this bedding set to a friend. I love the colors and print. This comforter is about 6 inches narrower than the Bali, which fit our other king bed much better. Then, it got some food stains on it, so I took it to be professionally laundered. The colors faded somewhat and lost their "new" look. It is a nice cotton, but not Matelasse. Very comfortable weight. There are a few strings from stitched in the comfoter that were long and needed trimed. I'm talking about where they sew 2 inch lines to keep the matting in place. The color is exactly as my computer showed and I really like the design and feel of the set. My husband is especially pleased. Not as pictured. The comforter does not smooth out because of (odd) little two inch seams sewn in random places throughout the fabric. It makes the bed look "slept-in" rather than smooth! Like it, but. . . . I believe the queen size comforter is 90 x 90 inches. Why a square for an oblong bed? I have a 15.5 in deep mattress. The comforter doesn't adequately cover a queen sized bed. I noticed another customer bought a king size comforter for her queen size bed. I should have done this, too. If I can find sheets for my extra thick mattress that should help disguise the problem of the gap between comforter and dust ruffle. 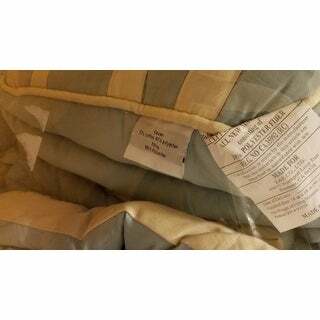 The comforter is NOT matelasse' as described. There are occasional vertical stitches scattered across the comforter to anchor the stuffing, but it is not quilted. Upon opening the package I noticed everything was extremely wrinkled which is to be expected. I used my iron's steam setting and lightly hovered across the comforter while it was on the bed. However, when ironing the bedskirt DO NOT iron the cheap fabric the dust ruffle is attached to. It easily melts. Aside from the above issues, I like the set. The accessory pillows are quite lovely on the bed and a bonus for such an inexpensive set. I do not consider this a high end purchase but it is fine for a guest room. Having moved to the mountains I wanted nature inspired bedding but wasn't looking for a rustic cabin style with deer and moose. The birds are appealing though larger than I would have liked. I'm still working on making the set work. But I have to say it was a good buy, and if I can find sheets large enough for my mattress this set will look lovely. It's just a hassle getting there. Beautiful colors, looks exactly like the pictures, blue is a little more greenish blue but that’s what I needed. Comforter has wide range of different shades of blue on an ecru background. Very pretty, unique and comfortable. Would buy again. I wish it was bigger and not so wrinkled! I bought this due to positive reviews, and the posted pictures. The picture, in my opinion, shows a comforter a size larger than the bed. I have a 10" mattress on a platform, and the queen comforter barley covers tha sides at the level of the platform. If I pull the comforter down to cover the foot of the bed down to the platform, it is a good six inches off the head of the bed. Pillows can not be covered under the comforter. The second issue I have is that it arrived looking rumpled, and is impossible to un-wrinkle. I have washed it twice and used a steamer, and it still looks wrinkled, messy, and rumpled. I love the colors, and the bed skirt is nice, but I would not buy it again. A king size would not fix the problem of the length, so I do not think a good fit is possible. I am disappointed, and wish I had seen a review about the wrinkle issues before purchasing. Beware! I love the comforter and shams, the fabric is soft and the quality is so much better than I expected. Wish there were matching drapes! High end look without the price tag! This bed set is fabulous! The quality is shockingly sumptuous with a super comfortable feel right from the first wash. The print looks very upscale shabby chic but at the same time doesn't feel overly feminine. My husband even loves it so that says it all!! The added pillows are beautifully made and really make the set that much more stunning! This is one of my favorite Overstock purchases!! This is a beautiful comforter and I'm very happy with it. The 3 pillows and shams make it a great deal. The weight of the comforter is just right as well and the fabric is lovely. I thought this set was beautiful when I ordered it. When it came it was a completely different color from the picture. The cream/ivory background was much darker brown, and the blue was more of a greenish shade. Beautiful in its own right, but not what I wanted. Didn’t open it so can’t comment on quality. Annoyed that overstock doesn’t do free returns and I paid *** for nothing. I dont even especially have a thing for birds. I love the colors, the birds, overall design. Im also very happy with its thickness, its very warm. The fabric seams strong and slide around on the bed. I love walking into my room and seeing this. Product info incorrect. Frustrating experience. Product info says 100% cotton with 100% polyester fill. In fact, the comforter reverse side is only 53% cotton. I asked for a replacement since the Overstock agent by chat (I have the transcripts) said it was an error in shipping and now i see, I have been sent the very same one again. Why say this at all and initiate a replacement without checking? What a waste for Overstock to be spending such money on returns, which obviously get passed on to other customers. And what a waste of time for customers. LOVE the fabric. Was so tired of the polyester blend sets I had been getting. This one is smooth, sturdy fabric with a beautiful pattern. Love the decorative pillows that come with it. Highly recommend. 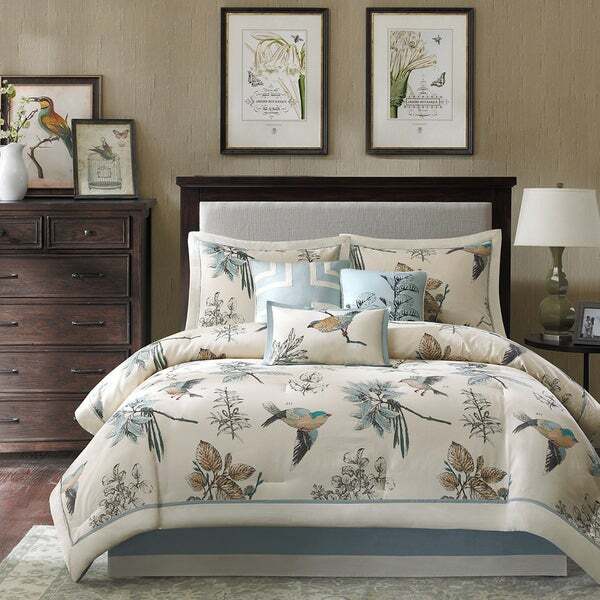 This comforter set is beautiful and a very good value. The three included pillows are adorable and unique. I’m very happy I elected to get this for my master bedroom. Great quality. Color is more a soft light turquoise than blue. Still love it. Like it very much - nice and warm. It looks so nice in our bedroom. This comforter is so cute. Is is very thick and looks great in the room with my blue walls. Also bought the matching shower curtain to go with it. Quality bedding. More cream color than white. Does attract dog hair though! "Where can I find the pictures above the bed and the rug under the bed?" The pictures are not available, they were for display only. "Looking for the washing directions since it is cotton will it need special care or can I launder it at home?" "What is the headboard pictured? Is it sold on overstock?" No, the headboard is not available. "does this particular comforter set come in just the comforter with matching shams?" "What color sheets should I order for this comforter set?" "Is the ivory border all the way around? I want to turn a king size comforter on a queen size bed and need to be sure the border is at the top of the comforter." The 8" ivory border is on the two sides and the bottom, not at the top. If you go with the Grey Barns Sleeping Hill design, the pattern is directional and wouldn't look right if you turned it. "Does the filling bunch up when it's washed or after use?" It should not bunch of if the washing instructions are followed.